Holiday means; to call some of your friends, throw a party and have fun. Obviously, it is economical to host a party at home than any restaurant. If you want to have fun and you want it in economical ways, buying a Weber Portable Cart for Grilling is the way to go. The question arises here why it is the best option? So far it is worth purchasing as you can do barbeque outdoors by placing the grill on this portable grill cart. Moreover, this will add glam to your patio in reasonable price. Are you looking for a quick foldable grill cart for an outdoor party? You will not find it in your dreams, but it is available in reality under the name of Q portable cart from the Weber Stephen manufacturers. The Weber cart for grilling is the new series that has added recently for your convenience so that you can take it at any location you want. Grilling was never this easy in the past as it is now just because of the use of technology and the human mind. There is still preference among people between charcoal grill versus gas grill. The portable cart supports only gas grills of its brand, particularly the models known as Q1000 and Q2000. Its design is innovatively engineered to make it look stylish, and the material used in this cart is sturdy and durable. The Weber cart is also appropriate to carry it to the beach. It contains hook strap that folds to transport with the help of a touch button. Furthermore, it will not take your extra energy hence it is lightweight. 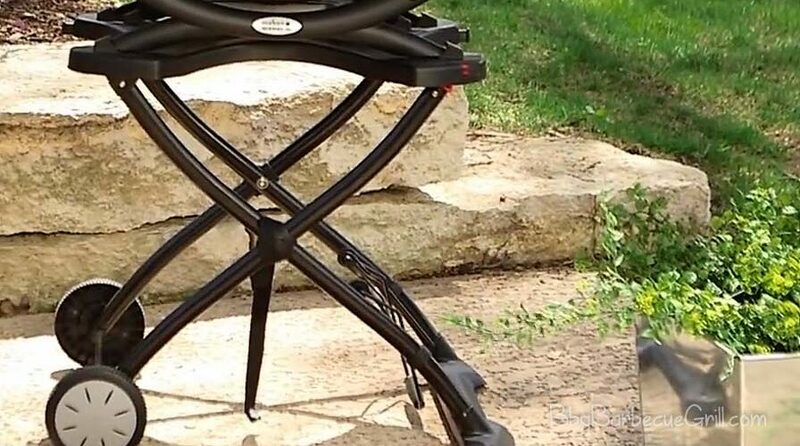 Unlike other grilling carts that do not stand firm, it has a unique front-loading pattern that locks it and makes the stand stationary. Grilling can be joyous whether you do it in summers or winters. There is a need for a high-quality cart like Weber 6557 as it has two durable wheels suitable in all weathers. It is equipped with special leg locking indicator which makes the grilling experience smooth at any desired location. How about the grilling cart, which gives you space for storing tools you might need for grilling? Undoubtedly, it sounds amazing. You can find the place for storing at the bottom of this grilling cart. The only improvement required is the stability of the cart as it becomes unstable upon folding. You might not buy the Weber cart because it only allows the Q grill series to fit. It is not versatile. While pulling the Q cart, you need to use more force by supporting with both hands otherwise the grill might fall. After considering all the features and information of Weber Portable Cart for Grilling, we assume that now you have a clear vision of why you should buy it. Before buying, always remember things that matters are the quality, pricing, design and the potential. There are certain warnings that you need to know before using the Q portable cart as to prevent yourself from any danger. We are proud to announce that Weber cart has got all of these.